It’s ten years since The Souljazz Orchestra released their debut album Uprooted in 2005. However, The Souljazz Orchestra were no strangers to the Canadian music scene. They came to prominence two years after a new millennia dawned. Since 2002, The Souljazz Orchestra have been showcasing their inimitable sound. Back then, The Souljazz Orchestra were fusing everything from Afro-beat, Carribbean, jazz, Latin and soul. That’s still the case. Since 2002, The Souljazz Orchestra’s inimitable sound has come courtesy of blazing horns, vintage keyboards, a myriad of percussion and a oulsating rhythm section. They provide The Souljazz Orchestra’s heartbeat. In full flow, it’s an irresistible and impressive sound. Especially, when when The Souljazz Orchestra kick loose, That’s why The Souljazz Orchestra’s albums have been so popular. Two years after releasing their debut album, The Souljazz Orchestra released their sophomore album Freedom Must Die in 2007, Manifesto followed in 2008 with their acoustic album Rising Sun released in 2010. For their fifth album Solidarity, which The Souljazz Orchestra’s first album for Strut Records, they changed direction musically. Gone was the acoustic style of Rising Sun. Replacing it, was an electric, vocal driven style. Joining The Souljazz Orchestra were a number of guest artists, They join The Souljazz Orchestra and their eclectic selection of instruments, as they embark on a journey through African, Caribbean Latin music, via detours into jazz and soul. The result was an album that had raw lo-fi, analogue sound. It was released to widespread critical acclaim, This was a perfect way for The Souljazz Orchestra to celebrate their tenth anniversary. Another two years passed, and The Souljazz Orchestra returned with their sixth album Inner Fire. Just like their previous albums, Inner Fire is a compelling fusion of musical influences and genres. That’s no surprise. The Souljazz Orchestra absorb influences like a sponge. This is apparent on Inner Fire. Since the release of Solidarity, The Souljazz Orchestra have continued their musical voyage of discovery. Members of The Souljazz Orchestra have worked with some of the most talented musicians in Cuba, Haiti, Nigeria and Rwanda. These master musicians have influenced The Souljazz Orchestra. Their influence could be heard on Inner Fire. It was a musical melting pot, that was given a stir by The Souljazz Orchestra. The result was a tantalising tasting dish, best tasted often. That’s the case with The Souljazz Orchestra’s latest album Resistance. Nineteen month after The Souljazz Orchestra released Inner Fire, they return with their seventh album Resistance. It was released by Strut Records on 4th September 2015. Resistance sees The Souljazz Orchestra add some new ingredients to their musical melting pot. With each album,The Souljazz Orchestra always try something new. Theis means that can’t be accused of remaking that same album. So, when The Souljazz Orchestra began work on Resistance Pierre Chrétien explains that: “we approached this album with a fresh ear,” That was admirable, given the success they were now enjoying. Many groups having found a winning formula, would’ve stuck to it. Not The Souljazz Orchestra. There was no way The Souljazz Orchestra were going to remake Solidarity or Inner Fire.” Far from it. What they were determined to do, was move forward. To do this, Pierre revisited the music that had inspired him. He explains: “We were keen to build on the band’s sound and message, so I brought in some of the French Caribbean and Francophone West African influences that I’ve loved since my youth.” To do this, Pierre and the rest of The Souljazz Orchestra have fused elements oupé-Décalé, Zouk, and Ndombolo to their usual mixture of Afro-beat, funk, jazz and soul. The result was Resistance, a ten track album that tells the next chapter in The Souljazz Orchestra story. Just like previous albums Reisistance. the lyrics are full of searching, scathing social comment. Some of the tracks are dance-floor friendly. Both are what listeners have come to expect of The Souljazz Orchestra, They recorded Resistance their way at their Ottawa studio. The Souljazz Orchestra’s studio in Ottawa is no ordinary studio. Far from it. It’s best described as an analogue studio, which is full of an eclectic selection of instruments. Many of these are instruments are long lost, sometimes unloved junk shop finds. A transistor organ, cheap guitars, reverb and echo units, an electric piano rescued from a dumpster and the crowning glory, an old eight-track Tascam tape machine, that was bought at a yard sale by the Royal Canadian Mounted Police. Incredibly, the ten tracks on Resistance were recorded on this old eight-track Tascam, which is described by The Souljazz Orchestra as temperamental. This gives Resistance a really raw lo-fi, analogue sound. Resistance features the now familiar lineup of The Souljazz Orchestra. They got to work recording their seventh album Resistance. This included songwriter Pierre Chrétien. He plays a selection of vintage keyboards and adds percussion and vocals. Marielle Rivard adds percussion and vocals. The horn section features tenor saxophonist Steve Patterson, baritone saxophonist Ray Murray and alto saxophonist Zakari Frantz. They all add percussion and backing vocals. Providing The Souljazz Orchestra’s pulsating heartbeat is drummer, percussionist and backing vocalist Philippe Lafrenière. This time, the lead vocal changes hands. Pierre Chrétien, Ray Murray, Philippe Lafrenière and Marielle Rivard all deliver lead vocals. That’s the personnel that played on The Souljazz Orchestra’s latest album Resistance. It’s described as “a defiant celebration of social justice and human empowerment.” Resistance also features the latest chapter in The Souljazz Orchestra story, as their music continues to evolve. They’re musical chameleons who are determined never to stand still. Constantly, they seek to reinvent themselves. This they do with each album. Similarly, with each album, word spreads about The Souljazz Orchestra’s unique, and inimitable sound. It’s showcased on Resistance which could well be their finest hour. Is that the case? 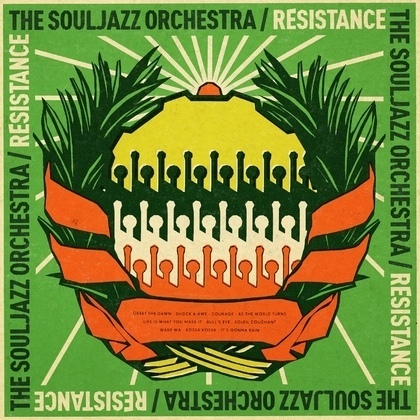 Greet The Dawn opens Resistance, The Souljazz Orchestra’s seventh album. Stabs of urgent growling horns combine with the pulsating rhythm section and percussion. Horns sound as a scatted vocal enters. Thunderous drums sound as the vocal becomes an impassioned plea: “for a better way of for the workers.” Meanwhile, the rest of The Souljazz Orchestra create an irresistible, genre-melting wall of sound. If there’s no change, there will be consequences the vocal warns: “if you kick a dog long enough, the dog bites back.” By then, the rhythm section keep things funky, while elements of Afro-beat, Caribbean and soul become one as The Souljazz Orchestra combine musical genres and social comment. Shock And Awe explodes into life at breakneck speed. A myriad of percussion combines with a thunderous rhythm, searing guitars, vintage keyboards and braying horns. Briefly, a siren sounds before a vocal is unleashed. It’s a mixture of power, passion, energy and enthusiasm. Pierre sings call and response with the rest of The Souljazz Orchestra. By then, they’re in full flow and it’s a joy to behold. That’s why recently, they’ve opened for Stevie Wonder, Bob Dylan, and Femi Kuti. The Souljazz Orchestra’s horn section explodes into life on Courage. Soon, they’re sashaying their way across the arrangement. As they do, a joyous and uplifting soundtrack accompanies them. It comes courtesy of the horn and rhythm section. They combine with percussion to create the backdrop for a vocal that sings of finding Courage. Later, a vintage synth plays during the breakdown. From there, this joyous and uplifting anthem rebuilds, sweeping everyone along in its wake. Just percussion and drums open As The World Turns. Soon, a funky bass and guitar join. Next up is one The Souljazz Orchestra’s vintage keyboards. It’s a contrast the rest of arrangement. So is the beautiful sound of Marielle Rivard’s vocal. Her vocal is very different from Pierre’s. It’s perfectly suited to the sunshine soul of As The World Turns. Behind her, the rest of The Souljazz Orchestra are in full flow, As usual, they’re seamlessly fusing musical genres. This includes Afro-beat, electronica, folk, funk, jazz and soul. They’re combined to create a celebratory song that’ll get any party started. Gradually, Life Is What You Make It arrangement’s unfolds. Straight away, The Souljazz Orchestra combine elements of Caribbean, funk, jazz and soul. Soon,they’re advising: “Life Is What You Make It, don’t let it pass you by.” By then, the listener realises this is an old song given a makeover. To do this, The Souljazz Orchestra combine braying horns with the rhythm section, keyboards and percussion. They provide the perfect backdrop for a heartfelt, hopeful vocal. It plays its part in the sound and success of the reinvention this familiar track. Growling horns gallop along on Bull’s Eye. They’re joined by percussion and stabs of keyboards. Bursts of vocal are added. Mostly, though it’s just the rhythmic delights of The Souljazz Orchestra that takes centre-stage. They feed off each other, as if playing a game of daring do. The horn section taunt the rhythm section to reach the heights they’ve previously reached. Even the keyboards and chiming guitar get in on the act. So does an urgent vocal. Harmonies reply to the shouts of: “take a bull by the horn.” Then a blistering saxophone solo steals the show. After the breakdown, The Souljazz Orchestra gallop along as Bull’s Eye reaches its dramatic crescendo. Briefly, The Souljazz Orchestra drop the tempo on Soleil Couchant. Before long, a thunderous drum beat drives the rhythm section along. Above the arrangement sits bursts of growling horns. Percussion punctuates the arrangement as Marielle Rivard delivers a joyous vocal. When her vocal drops out, it’s replaced by the horn section. Along with the rhythm section, they combine the music of the past and present. In The Souljazz Orchestra’s hands, it becomes the music of the future. Especially, with Marielle Rivard adding a vocal to this truly irresistible call to dance. Pounding drums and blazing horns create a dramatic, urgent arrangement on Ware Wa. A vampish vocal is added. Then the tempo rises, and the tempo begins to play a more prominent role. By the harmonies are added. Soon, another dance-floor friendly arrangement unfolds. Crucial to is success are the dusty Hammond organ, percussion and blazing horns. They add a Caribbean sound to another joyful fusion of musical genres and influecnes. As the rhythm section ensure arrangement to Kossa Kossa becomes uber funky, a James Brown-esque vamp is added. It has an Afro-beat influence. So do parts of the arrangement. That’s apart from the synths. They’ve an Acid House influence. The horns add an Afro-beat influence. So do the funky rhythm section. They’re responsible for a funky, hypnotic sound that’s truly delicious. It’s Gonna Rain closes The Souljazz Orchestra’s new album Resistance. Stabs of drums and horns combine with percussion as The Souljazz Orchestra create a much more spacious, laid-back vibe. That’s the case with vocal as it sings: “It’s Gonna Rain, wash away your troubles.” Meanwhile, horns bray and blaze, while the rhythm section and keyboards combine, Later, a sultry saxophone is gonna “wash away your troubles.” That’s the case throughout Resistance, The Souljazz Orchestra’s new album. It’s without the best of their seven album career. That’s no exaggeration. Resistance, which was recently released by Strut Records, see The Souljazz Orchestra at their very best. Good as Solidarity and Inner Fire were, Resistance, the third part in The Souljazz Orchestra’s Strut Records’ trilogy is a career defining album. No wonder. The Souljazz Orchestra in full flight on Resistance is a joyous, impressive and irresistible sound. Especially when they’re tempting the listener to the dance-floor. They tease and tempt the listener with blazing horns, vintage keyboards, a myriad of percussion and a pulsating rhythm section. They provide The Souljazz Orchestra’s heartbeat. It’s an irresistible sound. Few can resist the delicious sound of The Souljazz Orchestra as they fuse everything from Afro-beat, Carribbean, jazz, Latin and soul with elements of Coupé-Décalé, Zouk, and Ndombolo. That’s not forgetting lyrics bristling with cutting social comment. The result is a potent and heady brew. It was recorded in The Souljazz Orchestra’s Ottawa studio. It’s decidedly lo-fi. Don’t expect to find the latest equipment. No. It’s an analogue studio full of an eclectic selection of instruments. Many of these are instruments are long lost, sometimes unloved junk shop finds. A transistor organ, cheap guitars, reverb and echo units, an electric piano rescued from a dumpster and the crowning glory, an old eight-track Tascam tape machine, that was bought at a yard sale by the Royal Canadian Mounted Police. These instruments come to life in the hands of musical alchemists, The Souljazz Orchestra as they recorded their career defining album Resistance. They’re proof that it’s not the type of equipment used to record an album, it’s what you do with it. In the case of The Souljazz Orchestra, they’ve recorded a career defining album, Resistance. It features The Souljazz Orchestra at their funkiest and most soulful. Especially when they kick loose, and tempt and tease listeners onto the dance-floors. Resistance is impossible The Souljazz Orchestra get the party started with their heady and irresistible musical brew.